I don’t think I’ve made much of a secret of the fact that I have had reservations about the 3DS more than I have for any other Nintendo system I can remember, possibly more than any system launch from all of the manufacturers. The poor launch line-up, terrible battery life for a Nintendo handheld and justified concerns over the 3D effect causing headaches and eye-strain all added up in my mind. Now that the system is here and in the hands of a great many gamers across the world, we come to the realization that all three of these things are definite problems, albeit some more than others. The battery life, while not an absolute disaster is still very un-Nintendo like. My DS lite and XL seem to just go on forever, and that’s not mentioning the gameboy series. Those lasted even longer on just AA batteries. Battery technology still remains the bane of gadget makers’ existences. People like Apple, Nintendo and Sony can innovate endlessly on every aspect of their devices, but batteries just haven’t evolved to the same extent. Apple give the illusion of battery innovation, but in reality all they’re doing is just making them bigger and packing them in tighter. This makes them last longer but also has the drawback of being non-user-replaceable. I’m sure the situation will improve with the 3DS lite if that will be the name of the redesign we’ll see in the next couple of years, but I can’t see how it can improve that much, especially if a newer model will likely be slimmer. Next on the issue list is the 3D effect. Nintendo made a great decision by putting a depth slider on the system. If it had a fixed level of 3D with no off switch or even an adjustable slider with no off then it would have been a terrible move. It’s not that a great number of people are complaining about the 3D giving them problems, but at least Nintendo have given themselves a get out of jail free card in that they can tell people to simply turn the 3D off. They’ve done about as good of a job as they could do to protect themselves from possible lawsuits, and you know someone’s going to try it. At first, the 3D really impressed me but after that short time, I started to get a headache and felt uncomfortable. This was with 3D at the max setting. I was a bit depressed with my purchase after that and turned the effect off completely to avoid further headaches. When I showed it to my aunt and young cousin they both were fine with the 3D even at max strength. My aunt wears glasses so I was a bit surprised to find that she had no problems with it at all whereas I did. I even went to get my eyes tested for the first time ever, partly due to this discomfort. I was told that my eyes are fine so I’m still no closer to finding out why the 3D isn’t fully working for me which is strange. When I use 3D now it’s generally only in games and even then, only at less than half of the full effect. It’s disappointing in a way but at least I can still use it to some degree. I would definitely say that it’s personally close to being as bad a situation as I was expecting, so it falls into the same category as the battery life I’m afraid. The final disappointment is the launch library of games. There’s a couple of gems in the mix, Pilotwings and Super Street Fighter IV, but other than that, it’s very slim pickings indeed. I remember Reggie saying that the 3DS would have the best launch period of any system ever released. Even if he technically means the entire time between launch and E3, I don’t think this is what most people envisioned, as they probably thought at least either Zelda or Kid Icarus would be available at or soon after launch. Even if one of those games comes out before E3, it’s a long time to make people wait for a triple A Nintendo title for their new system. It’s also true that Reggie was talking about the North American launch, but the line-up has been similar here too. Worryingly, the key title that is being talked about on Nintendo UK’s site at the moment is Steel Diver, the submarine game that got average reviews from most outlets in the US. It’s hardly a blockbuster game and in fact I would label it as quite a niche title. That’s coming out in May here and if it’s being pushed this much then you would have to depressingly assume that there’s nothing else in the pipeline until at least the end of may or early June. Luckily I have Pilotwings to keep me busy, and I plan to rent SSFIV soon, but some gamers, such as my brother, have only the system itself and no games. They can’t even use the web browser as it comes in a later system update. I suppose they have FaceRaiders and AR games, but despite being pretty fun and quirky, don’t have the legs to be more than a party piece to wow friends and family. Now that I’ve gone over the three main issues with the system, I want to go into the actual aesthetics of the 3DS itself. The system looks quite nice, thinner than I thought as it looks very bulky in pictures, and the 3 tier colour scheme only adds to that effect. I would have preferred a white one but cosmos black is still nice. The blue one is very nice looking when you see it for yourself. The top seems to shift colour depending on the light and angle. The slide pad is very nice to hold and responsive. The D-Pad can be a bit uncomfortable to use now that it’s down below where it used to be, but if you shift your hand position it becomes manageable. The face buttons and the L + R shoulder buttons are much the same as you’re used to on all the DS models. The power button is bigger and more pronounced than the XL which I like as it’s far easier to press. However, I really don’t like the select, start and home buttons as they feel cheap and hard to press. It looks flimsy and prone to wearing away over time. I hope that doesn’t occur. The stylus is also modified. It now slots in the back of the system and is telescopic. When full length it doesn’t seem to be much bigger than the original ones were though. There’s also no way to lock it at full length which feels like a poor decision. The tip is now smoother where the DS ones all had a pronounced tip to them but there’s no real difference in feel. As far as the interface and built in software side of things, I think it’s a fair step up from the DS. At first, the main menu looks almost identical to the DSi but you can modify the number of icons on screen at once. I prefer columns of 3 personally. The top of the touch screen has a variety of icons, the most interesting of which is the friends icon. You have one friend code now and it’s universal for all games. This is great as you can now register someone without inputting the code, by being in the same room as them. You receive their mii and can then see them online and invite them to games. It’s a pretty cool system, and it’s one of the most exciting upgrades Nintendo have made that will drastically improve the online experience. Hopefully gone are the days of playing Mario Kart with more than just your one friend by counting down and then both joining a continental or worldwide game at the same time and hoping for the best. The built in games are actually quite impressive. As I’ve already mentioned, FaceRaiders and AR games are party pieces for the most part, but are still worth a try. FaceRaiders is the pick of them as it really does interesting things with face manipulation and the gyro of the system. My cousin very much enjoyed shooting me and her mum in the face while we made all sorts of strange expressions on screen thanks to the impressive face recognition. You do have to line up where the facial features are, but even so it’s cool to see. AR games is impressive but it’s also far more buggy. The cameras are very slow, just like the DSi ones were. It’s like Nintendo have a lifetime supply of VGA cameras that they can’t bear to part with. This hurts the Augmented reality effect, especially in 3D. It’s disappointing that you can lose track of the AR card easily and then have to find it again. The actual game itself though is impressive, especially if you’ve never really seen AR before. Realising you actually have to move your whole body around the card in order to dodge a dragon or hit a target you couldn’t see from other angles is definitely an impressive experience. If the cameras were more responsive then it would be an experience that I’d come back to it more often than my once and only time so far. 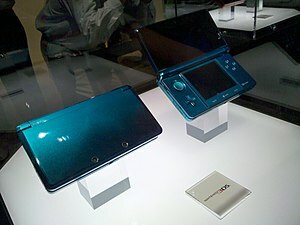 I think it will have a very tough task to catch the DS in terms of sales I still think it will be very successful. The DS was practically the perfect device for casual gaming and Nintendo took full advantage of that with Brain Training and various other casual titles. Because of the high price and 3D effect, I don’t think it will ever be as popular with older and more casual players but I may be proved wrong. It’s been a brave decision to go for 3D the way they have. Especially making the entire marketing push about that one feature. With that said, they’re arguably in the best position of any company out there to try such a bold move. You have to give them massive credit for taking such a risk when they could have easily played it safe with a DS2 with just primarily graphical and other technical improvements. The issue there is that they could still have been in a position to not appeal to casual gamers as much as its predecessor as those people will just say “I don’t need better graphics”. Overall, I think despite its drawbacks and early lack of real must-have titles, the system has a strong future ahead of it and bags of potential. It’s practically impossible for it not to considering how well Nintendo has understood and dominated handheld gaming for so many years.